Discussion in 'Off-Topic Discussions' started by Tiberius-Publicus, Oct 23, 2013. This place is ridden with Blasphemy! I would request an immediate Exterminatus of this foul place if I could! Be warned scum, noone can escape the might of the Emperor for long, you will meet your death soon. Edit: This a Pony free thread, if you'd like to create a thread for Ponies then please do so. Elector, KharnVarus, Vulpas and 67 others like this. Elector, KharnVarus, Henji and 119 others like this. ehem, back into character: You dare make fun of the Emperor in that manner? I will have your head for this! Grall_Stonefist, Soviatus, ProphetOfDaWAAAGH and 15 others like this. Blasphemy in one mans opinions or freedom for the other, we may die to always return but we die for what we picked to serve, your a slave to a man that is just bones on a throne, and yet you sacrifice 1,000 psychers to maintain his essence every day. My child you do not know it yet, you are blind to the truth, you are already serving Khorne far better then any of us in the midst of chaos can ever do. Dirty_Jackal, baltino, Cesspool and 36 others like this. ahh Araghast, I have heard of you. I'v also heard that you fell victim to a Blood Ravens strike force in sub-sector Aurelia. Tell me, how does defeat taste, cause I have yet to die to one of your kind, heretic. Jeimuzu, Soviatus, Wraithling and 12 others like this. Your corpse king scares me no more than your idle threats. Be gone with you, and for your sake pray we do not meet upon the battlefield. Alexanderis, Jeimuzu, Soviatus and 7 others like this. The mocker your kind shares is primitive but an enjoyable show. Soviatus, Wraithling, RobotElectroJones and 2 others like this. 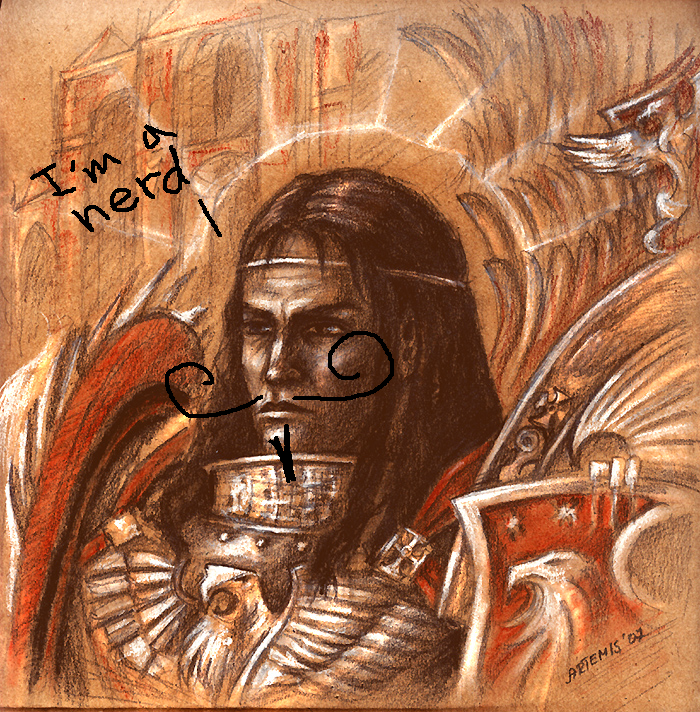 Welcome to the forums, son of Dorn! Soviatus, Wraithling, RobotElectroJones and 3 others like this. Soviatus, Wraithling, RobotElectroJones and 1 other person like this. 'Ello? Iz tis ting On? 'Ello space marine! I'm tha great Trovuz titanumtooth, I could stomp some spiky 'umies for some dakka... If ye get what i mean, HEHAHEHAHEHAHEHAHEHAHEHAHEHAHEHA! Soviatus, Antaeus, Ardenstrom and 2 others like this.